Incorporation and acidification of field-applied slurry are both used to control ammonia emission after application. This document discusses some details about these techniques, based on measurements of emission and the new ALFAM2 model. Incorporation of slurry into soil through tillage can substantially reduce ammonia volatilization after field application of slurry. However, timing is important. Ammonia emission rate is high immediately after slurry application, and it typically drops about 10-fold over the first 12 hours. Consequently, to achieve a high reduction in ammonia emission, incorporation most be carried out soon after application. 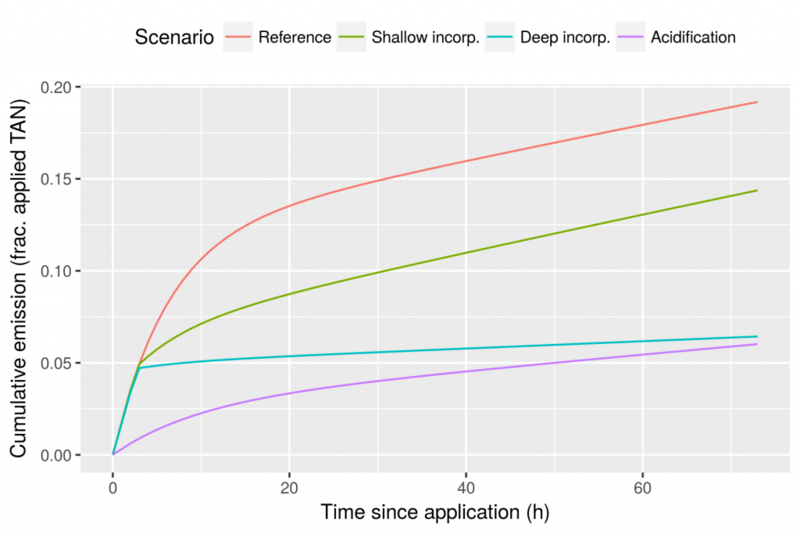 The ALFAM2 database, which contains measurements of ammonia emission and supporting data from more than 1800 field plots from 12 countries, can be used to quantitatively assess the importance of incorporation timing. Although results vary, these measurements show that about half of ammonia emission that occurs over 3 days is typically lost within the first 6 hours after application. After 24 hours, this value is more than 75% in many cases. The new ALFAM2 model (developed in part from the database) can also be used to explore the effects of incorporation timing. If carried out immediately after slurry application by trailing hose under reference conditions (13°C air temperature, 2.7 m/s wind, 6% slurry dry matter, 40 t/ha application rate), deep incorporation (moldboard plough) can reduce cumulative 3 day emission by nearly 90%. But this reduction drops to under 70% after 3 hours, about 50% after 6 hours, and only 30% after 24 hours. Shallow incorporation (harrow) is less effective at reducing emission. Even immediate shallow incorporation is predicted to reduce emission by only about 40%. This reduction drops to 16% if incorporation occurs after 6 hours, and to virtually null after 24 hours. Under conditions with high emission potential (e.g., higher temperature or wind speed) reductions due to incorporation will be somewhat smaller. Conversely, under more favorable conditions, reductions may be larger. Slurry acidification is an alternative for reducing ammonia emission, and the ALFAM2 model includes acidification parameters based on experiments carried out in The Netherlands in the early 1990s and in Denmark in 2010. For trailing hose application under reference conditions, acidification to pH 6.0 is predicted to reduce emission by nearly 70%. In practice the effect of acidification may be lower, depending on, for example, the quantity of acid added and the timing of acidification. Additionally, the predicted effect of acidification is reduced (smaller relative reduction in emission) as conditions for ammonia emission from slurry applied in the field increase (higher overall emission). Under extreme conditions (broadcast application, 10% dry matter, 35°C air temperature, 15 m/s wind, 5 t/ha application rate) the predicted acidification reduction drops below 10%. This response is related to the mode of action of acidification: a reduction in the concentration of free NH3. When the potential for cumulative emission is high, nearly all slurry TAN can eventually be lost, regardless of a change in the rate of emission. In summary, both incorporation and acidification can be effective for reducing ammonia emission from field-applied slurry. However, details are important. Figure 1. Cumulative emission of ammonia from field-applied slurry over 72 h (3 d) as predicted by the average ALFAM2 model. Predictions are based on cattle slurry with 6% DM, pH 7.5, applied by trailing hose at a rate of 40 t/ha with 13°C air temperature and 2.7 m/s wind (at 2 m height). Incorporation occurred exactly 3 hours after slurry application.